heatherkay wrote: Where could they have built the physical plant instead? slimwhitman wrote: The fact that they built a facilities plant at the SW corner of a vibrant 39th & State Line a few years ago shows they have no understanding of how they should relate to their neighbors. Agreed, the plant is ugly and depressing, if necessary. However, from what I could tell from the rendering, I'm optimistic about the new building and how it will bridge the campus with the neighborhood. It looks like they're thinking about landscaping and how to lessen the traffic impact. My hopes were not high going into the neighborhood meeting, since I don't love every single existing KU Med building, but I was pleasantly surprised. It could have been built in that location, but with a kind eye to 39th with a liner building along the street. As built, it flips a middle finger right at 39th & State Line and serves to buffer the campus FROM the state line activity instead of embracing it. ..and 39th thru campus is an over-engineered car sewer. Again...hospital standard procedure. Same thing was done by St. Luke's on 43rd at Wornall. This is in case two fire trucks break down side-by-side, a third can still pass. Do we really need this extra pavement? Well, there are structures right on that corner -- I'm not sure what's all under there, but there are a dozen manhole covers and other access points. I suppose they could have put a building on there, but it would just be a dummy. It's not not they could have put a shop there or anything else that would add more than what's there now. 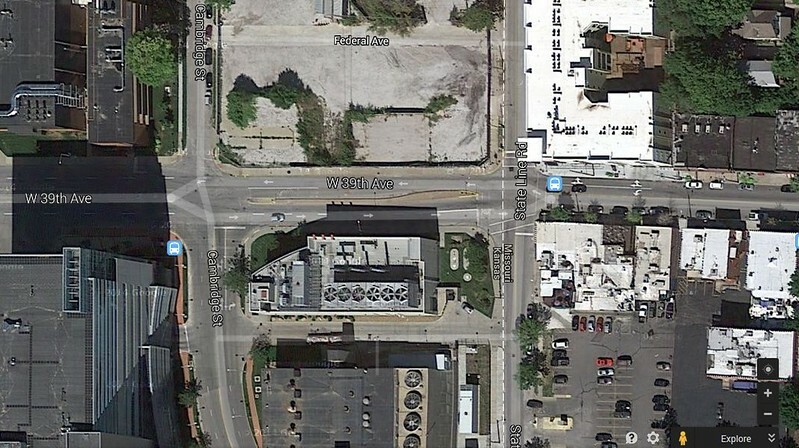 And as far as that being a car sewer, that stretch of 39th Street is one of the few blocks in KC where a pedestrian can make all the traffic stop when they cross the street, without a stop light, and the 20 MPH speed limit is aggressively enforced. I'm totally OK with one of the most important regional trauma centers being overengineered for multiple fire engines and vehicles. Buildings like hospitals have design requirements that don't always lend themselves to aesthetics or pedestrian ideals. heatherkay wrote: Well, there are structures right on that corner -- I'm not sure what's all under there, but there are a dozen manhole covers and other access points. I suppose they could have put a building on there, but it would just be a dummy. Everything there could have been designed/configured differently. Anything you see today is irrelevant. They designed it with zero intent of enhancing an experience as a driver or pedestrian. They left a shrubage area because they know a few shrubs can fix their deliberate ignoring of adjacent uses. heatherkay wrote: I'm totally OK with one of the most important regional trauma centers being overengineered for multiple fire engines and vehicles. Buildings like hospitals have design requirements that don't always lend themselves to aesthetics or pedestrian ideals. Not OK. Never OK. Same could be said for any use. Not every part of the facility needs to be pedestrian scaled, but locations like this that interface an active part of the neighborhood MUST be designed for all users, not just for some wacky what-if scenario. I seriously have had a fire chief demand that a development plan I was working on must have a 20' wide fire lane sidewalk so fire trucks could pass each other if one had broken down. The fact that the campus cops have to patrol 39th for speeders is the first clue that the street is over-engineered. The design speed should be 20mph, not 50mph. This isn't just a street in a random neighborhood or shopping center. If there is anywhere that a wacky what-if scenario is justified, it's there. And keep in mind that the hospital was there first, with the shops and other amenities springing up to serve it. heatherkay wrote: And keep in mind that the hospital was there first, with the shops and other amenities springing up to serve it. Not really. Sure, there was a small hospital there that grew, but the shops pre-dated a hospital of any real size. 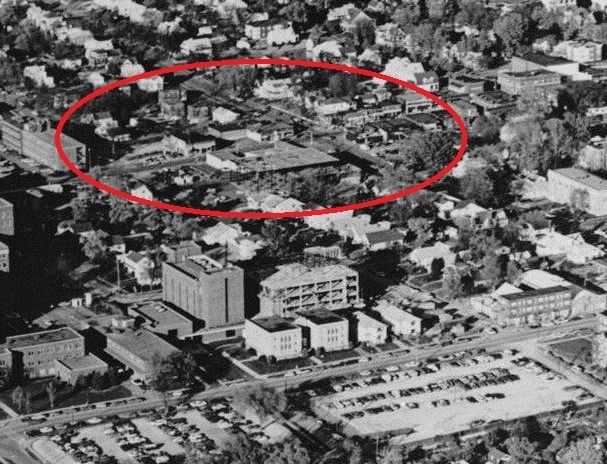 The original hospital was on Rainbow and the look and feel of the 39th street retail on the Missouri side extended all the way to Hudson (now known as Rainbow). See photo. Since when has "being first" ever mattered in urban design?? Hospitals should not be exempt from good urban design. Hospitals can be responsive to urban design, but it shouldn't be their first priority. Last edited by pash on Thu Feb 09, 2017 11:54 pm, edited 1 time in total. If the KU Hospital complex would have been built all-at-once or in planned stages I am sure it would have a different look than it does today. But the expansions over the decades for the most part were done in piecemeal fashion, isolated from each other. Funding secured for the med school building development on the northeast corner of rainbow and 39th. 2016 is expected start of construction with 2017 opening. Their fundraising capacity is pretty amazing. I drove through Greensburg, KS two times a few years back. Their new hospital is the most substantial facility in town and that's clearly not an area where they self-funded it using taxes. Last edited by pash on Thu Feb 09, 2017 11:58 pm, edited 1 time in total. pash wrote: The hospital in Greensburg, like much of the rest of the town, was destroyed in an F-5 tornado in 2007. The snazzy LEED-Platinum replacement was built with money from insurance, FEMA, and the state, not charitable donations. Exactly. I'm not sure how you can even try to compare the economics of a community hospital for a county that only has 2,500 (there's nothing else substantial between Pratt and Dodge City), to a large research hospital in a large city. They've started bulldozing the west side of State Line north of 39th for site prep on the new building. If I remember correctly, the northernmost section will be used for parking for construction crews. A little down the road, at 43rd & Rainbow, I saw the McDonald's has been torn down. I know nothing, but I assume they are building a new McDonald's. You got it, it's the next iteration of the franchises. Cafe & all that. Last edited by pash on Fri Feb 10, 2017 9:57 pm, edited 1 time in total. Subway, IHOP and "Topp'd", a pizza joint coming.